A determined Martin Luther King, Jr. stares forward into the future at the newly dedicated MLK Memorial on Washington’s National Mall. Fusion of three exposures, all with an aperture of f/5.6, all ISO 100, all 48mm. The shutter speeds, due to the high tones in the white statue, are 1/200, 1/320, and 1/500 sec. DEATH PERMANENTLY RENDERS REAL HUMAN BEINGS INTO ABSTRACTIONS. With every photo, formerly every painting, drawing, or statue of a renowned person, some select elements of an actual face are rearranged into an approximation, a rendering of that person. Not the entire man or woman, but an effect, a simulation. The old chestnut that a certain image doesn’t do somebody “justice”, or the mourner’s statement that the body in the casket doesn’t “look like” Uncle Fred are examples of this strange phenomenon. Nothing amplifies that abstraction like having your image “officially” interpreted or commemorated after death, and, in the case of the very public Dr. Martin Luther King Jr., Washington’s National Mall offers two decidedly contrasting ways of “seeing” the civil rights pioneer. One is more or less a tourist destination, while the other is muted, nearly invisible amongst the splendors of the U.S. Capitol. Both offer a distinct point of view, and both are, in a way, incomplete without the other. 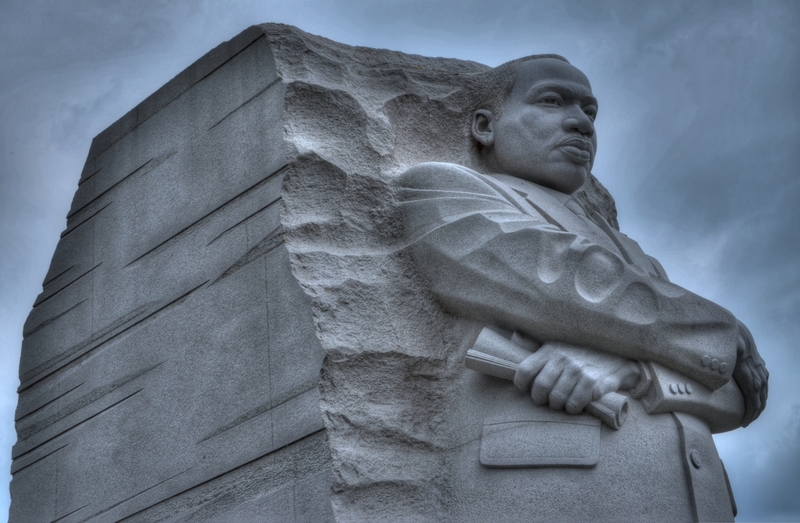 The official MLK memorial, opened in 2011 as one of the newest additions to the Mall, stands at the edge of the Tidal Basin, directly across a brief expanse of water from the Jefferson Memorial. Its main feature shows a determined, visionary King, a titanic figure seeming to sprout from a huge slab of solid stone, as if, in the words of the monument, “detaching a stone of hope from a mountain of despair”. Arms folded, eyes fixed on a point some distance hence, he is calm, confident, and resolute. This gleaming white sculpture’s full details can best be captured with several bracketed exposures (fast shutter speeds) blended to highlight the grain and texture of the stone, but such a process abstract’s King even further into something out of history, majestic but idealized, removed. 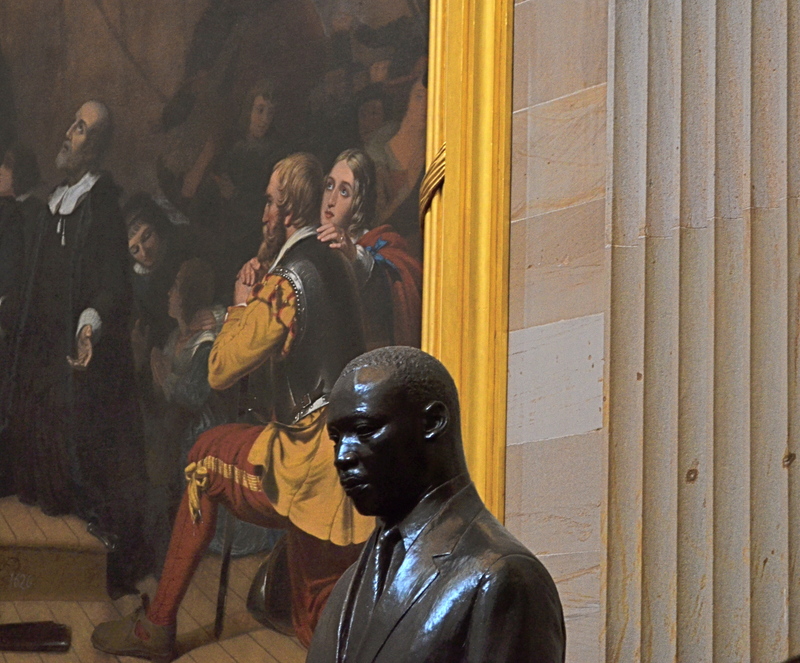 Another view: a somber bronze bust of Dr. King in the U.S. Capitol rotunda, flanked by the painting The Embarkation Of The Pilgrims. 1/30 sec., f/5.6, ISO 640, 55mm. The contrast could not be greater between this view and the bronze bust of King installed in 1988 in the rotunda of the Capitol building. This King is worried, subdued, straining under the weight of history, burdened by destiny. The bust gains some additional spiritual context when framed against its near neighbor, Robert Weir’s painting The Embarkation Of The Pilgrims, which shows the weary wayfarers of the Mayflower, bound for America, on bended knee, praying for freedom, for justice. Used as background to the bust, they resemble a kind of support group, a congregation eager to be led. Context mine? Certainly, but you shoot what you see. Inside the capitol, light from the dome’s lofty skylights falls off sharply as it reaches the floor, so underexposure is pretty much a given unless you jack up your ISO. Colors will run rich, and some post-lightening is needed. However, the dark palette of tones seems to fit this somber King, just as the triumphant glow of the MLK Memorial’s King seems suited to its particular setting. Death and fame are twin transfigurations, and what comes through in any single image is more highly subjective than any photo taking of a living person. But that’s where the magic comes in, and where mere recording can aspire to become something else. This entry was posted on July 3, 2013 by Michael Perkins. It was filed under Composition, D.C., darkness, Framing, HDR, History, Memorials, Monuments, Textures, Washington and was tagged with Jefferson Memorial, Martin Luther King, Martin Luther King Jr. Memorial, National Mall, Robert Weir, Tidal Basin, washington dc.